I ate lunch at this cafe today. It's at the back of a tiny lane, which can be easily missed if you don't know what you're looking for. 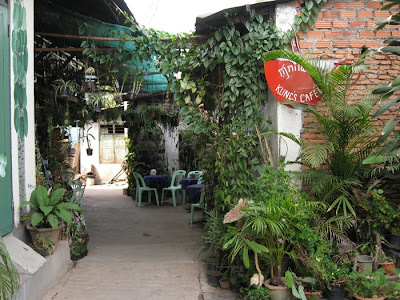 The seating area of the restaurant is actually the lane itself - but since the family lives in the house that forms the dead end, there aren't any motorcycles racing in between the tables, trying to get somewhere else. The food is simple and very inexpensive - just over a dollar for fried rice with a fried egg and a cup of hot coffee. Since I went over there towards the end of lunch hour, I didn't expect that there would be many people in the shop, much less people I knew. The lane is right across from the Ministry of Health so I met a few people I hadn't seen for quite some time. They were happy to see me - they thought I had returned to the US. "No, I've just been in the provinces all the time."